The FG3C Sweep/function generator provides sine, square, triangle waves and TL and CMOS pulse outputs from 0.3 to 3MHz. A built-in frequency counter with 6 digit display accurately shows frequency setting. 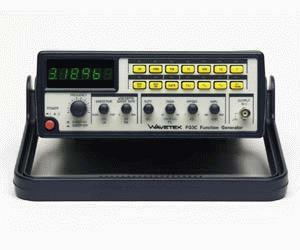 Or use as stand-alone frequency counter for external signals from 5 to 150MHz. Control the linear or logarithmic sweep of any of the selected signal outputs internally or with user provided external modulating signal. Produce TTL or CMOS pulses with the duty cycle function. Switchable 20dB attenuator allows for low level signal output.